Comfortable Villa With Private Pool, Beautiful Sea And Mountain Views. Villa Anastasia is a fully furnished 3 bedroom Villa in Pissouri Bay on a hill with lovely sea and mountain views. The main bedroom which is en suite and has a King Size bed and a dressing table is upstairs and doors lead out to a large balcony where you can sunbathe and have your breakfast or evening cocktails while enjoying the lovely views and sea breezes. The other 2 bedrooms, one of which is en suite, are downstairs and each has 2 single beds and a dressing table. Should a cot be required this and cot linen can be provided free of charge. The living room, dining room and kitchen, which is well equipped with the necessary appliances and with more than enough crockery and cutlery, are open plan so whoever is cooking can still enjoy the company of the rest of the party. The downstairs patio has a table, 6 chairs and 2 umbrellas, and overlooks the garden and pool. There are also 6 sun loungers and a portable BBQ. There is parking for one vehicle at the villa and other parking spaces close by. The beach, shops, restaurants, and traditional tavernas are within walking distance and Pissouri Village where there are banks, larger supermarkets, restaurants, Medical Centre and other facilities is only a few minutes’ drive away. The Aphrodite 18 hole championship golf course and the 2 Secret Valley 18 hole championship golf courses are about a 10 minute drive away and Paphos and Limassol are both about 20 minutes’ drive away. A Welcome Pack is provided to see you through for the first few hours until you can go out shopping. Linen, towels and pool towels are provided. Mid-stay clean for stays of 10 nights and over. Prices are subject to change up or down without notice but will not affect existing bookings. En-suite to bedroom 1 with shower, basin, wc. En-suite to bedroom 2 with shower, basin, wc. Third bathroom/guest toilet with with shower, basin, wc. Split unit air-conditioners for use in both summer and winter. Parking Space For One Car By The Front Door. More Parking for visitors close by. Hob, Oven, Fridge/Freezer, Washing Machine, Dishwasher, Microwave, Toaster, Electric Kettle, Coffee Maker. Aphrodite Hills Golf Resort - 10 min drive away. Secret Valley Golf Resort- 15 min drive away. Tsada Golf Course - 35 min drive away. Notes on accommodation: A Welcome Pack is provided. Smoking inside the property is not allowed. Pets are not allowed. Outside: Downstairs patio with table, 6 chairs, 2 umbrellas, portable BBQ, garden with private pool, 6 sun loungers. Large balcony upstairs with table & 2 chairs Clothes drying rack, iron, ironing board, small vacuum cleaner. Linen, bath towels and pool towels included. Weekly property clean. Mid-stay clean for stays of 10 nights and over. We thank Caroline for her review and are happy to see that they would be prepared to return to our villa. We try to make sure that the villa is well prepared for our guests in order that they can enjoy their holiday and to be helpful if any information or help is required. We would be happy to welcome Caroline and her party back to Villa Anastasia should they decide to revisit. Lovely, clean and comfortable villa! From the moment we arrived we were very impressed with the spaciousness and cleanliness of the villa as well as how well equipped it is. It is situated such that you are close enough to walk to the superb beach at Pissouri bay or if you prefer a short drive there is always parking available no matter what time of day. The beach is really lovely and unspoilt – a gem! The Villa has superb views of the sea and surrounding mountains from the balcony which is located just outside the main bedroom upstairs. The location is peaceful and at night very quiet and you can even hear the sound of the waves on the shoreline. Stacey the owner is a lovely lady who is kind and very helpful and who will do all she can to ensure that your stay at her villa is perfect. We will definitely be going back! Sorry it has taken me this long to respond to your lovely review, Chris. It was a pleasure having you as guests and we are very glad that you enjoyed your stay at the villa. We were very sorry that the villa was booked when you wanted to return. Best wishes to you both. A beautifully clean and well cared for villa with lovely views to the sea from the balcony and roof terrace. It is about a 10 minute stroll to the shops and many excellent restaurants and about 11 minutes to the beach. The owner, Stacey, was very attentive and helpful both before our arrival and also during our stay. Sorry it has taken me this long to respond to your lovely review, Peter. It was a pleasure having you as guests and we are very glad that you enjoyed your stay at the villa. Best wishes to you all. Pissouri Bay is one of our families happy places and this villa is a great base. Really we'll equipped with high quality fittings and furniture. Stacey (the owner) was really helpful and provided great information and advice. We look forward to returning soon for the great restaurants, lovely beaches and fun water sports. Sorry it is has taken me so long to respond. We are glad that you enjoyed your stay at our villa and thank you for your good review. It was a pleasure having you as guests. Our best wishes to your family. My family and I stayed at this villa in Oct 14 for a wedding at Columbia Beach Resort. It is only a 7/8 min walk to bay with restaurants and the Columbia Resort itself. The villa has 3 bedrooms and how the bathrooms are situated means you can all have a separate bathroom each. Very nice seating area at poolside and lovely balcony with seating on the top floor. All in all a very good standard and would highly recommend. I am sorry it is has taken me so long to respond to your good review. It was a pleasure having you as guests and we are glad that you enjoyed your stay at our villa. Our best wishes to you all. .
Planning my latest holiday brought our lovely stay at this villa to mind. We are very tempted to return for another chill-out in Pissouri Bay. The villa is lovely, very convenient to the restaurants and beach, with a wonderful view from the terrace outside the master bedroom. The terrace was lovely for breakfast and for evening drinks watching the sun go down. 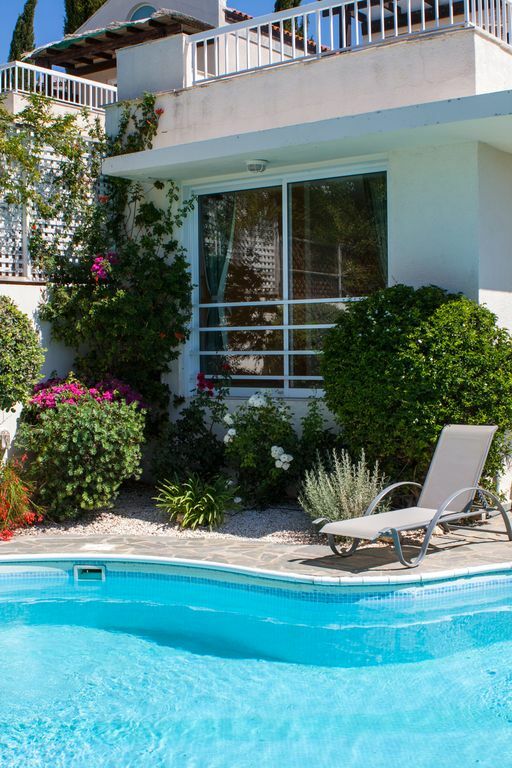 The villa is well equipped, clean and tidy with all mod cons and the agent very helpful. The little extras of books and games made it feel more like a home than a rented villa. Thanks to Stacey ( the very friendly owner) for ringing to make sure that everything was ok and making us feel at home. Some day we will maybe get the chance to meet up as I am sure we will come back again soon! My apologies for taking so long to respond to your great review. It was a pleasure to have you as guests and if we can we will be happy to welcome you again. Oue best wishes to you both. About 300m from the blue flag beach and crystal clear sea, small supermarkets and restaurants. About 30km from Paphos Airport. About 102km from Larnaca Airport. About 5km to Pissouri Village. About 38km to Paphos and 36km to Limassol. Pissouri Bay where one finds the Columbia Hotel a couple of small supermarkets and a number of local taverns is about 300m away. Pissouri Village with banks, larger supermarkets, restaurants, a medical centre and other facilities is about 5 km away. Booking Notes: 25% non-recoverable deposit upon booking. Balance 8 weeks before arrival. Changeover Day: Check In: After 2 pm on the start date. Checkout: By 10 am on the end date. Should you require a late checkout we would be happy to accommodate you if possible. Therefore please ask us and we will advise if we can help or not. Notes on prices: Prices are quoted for 3 bedrooms but should there be 4 guests or fewer who might wish to use only 2 bedrooms a Low Occupancy Discount can be considered throughout the year except July and August so please let us know if you would require this option and we will let you know the cost.